Background The modern primary healthcare workforce needs to be resilient. Early research framed professional resilience as avoiding ‘burnout’; however, more recent literature has introduced the concept of positive adaptation to professional challenges, which results in individuals thriving in their role. Aim To explore what primary health professionals working in challenging environments consider to be characteristics of resilience and what promotes or challenges professional resilience. Design and setting A qualitative focus group in north east Scotland. Method Five focus groups were held with 20 health professionals (six GPs, nine nurses, four pharmacists, and a practice manager) based in rural or deprived city areas in the north east of Scotland. Inductive thematic analysis identified emerging themes. Results Personal resilience characteristics identified were optimism, flexibility and adaptability, initiative, tolerance, organisational skills, being a team worker, keeping within professional boundaries, assertiveness, humour, and a sense of self-worth. Workplace challenges were workload, information overload, time pressures, poor communication, challenging patients, and environmental factors (rural location). Promoters of professional resilience were strong management support, teamwork, workplace buffers, and social factors such as friends, family, and leisure activities. Conclusion A model of health professional resilience is proposed that concurs with existing literature but adds the concept of personal traits being synergistic with workplace features and social networks. These facilitate adaptability and enable individual health professionals to cope with adversity that is inevitably part of the everyday experience of those working in challenging healthcare environments. Personal resilience has been much studied in the psychology literature. Resilience in health professionals has been investigated, albeit to a lesser extent, because health care can be particularly stressful as a result of frequent challenging situations. A literature review of nursing resilience and coping with workplace adversity concluded that resilience can be developed or strengthened, and that resilience development could be incorporated into nursing training.2 Resilience in a range of physicians has been studied in Germany4 and Australia.5,6 These studies identified features of ‘resilient’ practitioners such as positive attitudes towards the patient population and realistic role expectations, as well as strategies to minimise stress such as leisure activities. A recent literature review on resilience in primary healthcare professionals found resilience combined discrete personal traits and experience, leading to positive adaptation.7 Much of the previous evidence base framed health professionals’ resilience in relation to avoiding ‘burnout’.8–10 Health professionals’ resilience is clearly of global importance, although every country will have its own challenges depending on the structure of its healthcare system. Two areas previously identified as particularly challenging for primary care are working in areas of multiple deprivation,11 and working in remote and rural areas.12 Poor resilience leads to high staff turnover, which in turn impacts services for deprived and rural populations. However, some health professionals thrive in challenging environments. It would therefore be useful to study such resilient practitioners to determine what it is about them or their environment that enables them to thrive. As Bowden and colleagues noted,13 there is an increasing need for health professionals to develop effective strategies to foster resilience to counteract challenges, and to enable them to continue to thrive in their roles. This leads to consideration of whether health professionals’ resilience can be developed to improve workforce sustainability. Research to date has explored the resilience of health professionals. This study aimed to further our understanding by considering the individual in the context of their working environment. Individual characteristics were found to work synergistically with features of the workplace and social networks. A model of professional resilience in primary care in presented. This study aimed to explore what health professionals working in challenging environments such as rural areas or areas of multiple deprivation considered to be characteristics of resilience, and what promoted or challenged their professional resilience. From this, a model of health professional resilience is proposed. A qualitative focus group methodology was used because it is an efficient way to collect data and also because the generation of ideas that others can reflect on, which some participants may not have explicitly thought about previously, was considered ideal for this topic. The study took place in the north east of Scotland, which incorporates a large rural area and a city with areas of deprivation. Purposive sampling was used to include a range of staff with patient contact, based in the community, who care for patients who do not come under secondary care (GPs, practice nurses, district nurses, and pharmacists), and who routinely work in areas of deprivation or rurality. Potential participants were identified using the Scottish Index of Multiple Deprivation14 and Scottish Government Urban/Rural Classification15 for their practice location. Travel cost reimbursements were offered but no payment or incentive, and lunch/refreshments were provided. Initially, 15 practices (10 classified as deprived14 and five in areas classified as remote/rural)15 and 14 community pharmacies from deprived areas were contacted, and two pharmacists in rural locations invited to participate. What did participants consider to be resilience characteristics of health professionals? What did participants believe enabled or threatened professional resilience? Could resilience be developed or learnt? Groups were facilitated by a senior researcher accompanied by a research assistant. Each participant was asked for written consent before taking part in the focus group. Discussions were digitally recorded and transcribed. Three researchers independently coded the first two transcripts. A thematic framework was agreed by consensus then applied across all focus group data. Twenty participants attended five focus groups (characteristics are outlined in Table 1). The first four focus groups were held at general practice locations, one of which was attended by two nurses from a different practice, and the final session was held on university premises. Each focus group (FG) lasted for 45–60 minutes. In line with the topic guide, four themes were discussed: features of a resilient health professional; challenges to resilience; promoters of resilience; and developing resilience. Within each of these high-level themes there were emergent subthemes, which are presented in detail below using illustrative verbatim quotes. A number of characteristics of resilient health professionals were suggested, including optimism, flexibility and adaptability, initiative, tolerance, organisational skills, being a team worker, keeping within professional boundaries, confidence/assertiveness, humour, and a sense of self-worth. Themes that emerged when asked about challenges or threats to resilience were around workplace challenges and included information overload, time pressures, and environmental features, particularly associated with rural working. Suggested enablers of resilience were organisational structures, which included subthemes of strong management support, a team culture, and capacity for ‘buffering’, and work–life balance, which includes supportive home life and recreational activities. All participants agreed that resilience could be developed even if it was not a natural trait. When asked how resilience could be developed, emerging themes were experience, learning from others, and formal training. Participants in this study discussed resilience in relation to four themes: features of a resilient health professional; challenges to resilience; promoters of resilience; and developing resilience. Key ingredients of features of resilience included optimism, adaptability, initiative, tolerance, organisational skills, being a team worker, keeping within professional boundaries, assertiveness, humour, and a sense of self-worth. Challenges in the workplace included information overload, time pressures, environmental issues in rural locations, workload, poor communication, and challenging patients. Workplace promoters included a team approach, inclusion within the wider team and a secure base, buffers (or shock absorbers), the ability to say ‘no’, time for reflection, and personal and social factors, such as support from friends and family, and leisure activities. Developing resilience was considered to be possible through experience, learning from others, and formal training. Based on these findings, the authors propose a model of health professionals’ resilience in the community setting that concurs with the existing literature but adds further clarity to the concept of personal traits being synergistic with the workplace and social network. These facilitate adaptability and enable individual health professionals to cope with the adversity that is part of the everyday experience of those working in challenging environments. A strength of this study was the use of an inductive qualitative approach, which allowed participants to contribute their thoughts and experiences as they were generated in the focus group setting. The interest of participants was obvious through the richness of discussions. Focus groups were fruitful, with participants generating ideas from each other and endorsing or expanding on the views expressed by others. Holding focus groups in practice settings ensured that participants were more relaxed. A few participants attended late because they were held up with patient-related tasks. This in itself generated discussion about everyday challenges. However, a weakness of having those that work together in the same group was that they were less likely to be negative about each other or even admit if they thought they were not resilient. A range of settings (rural and deprived) and staff ensured a range of experience was covered. However, there may be subtle differences between professional groups (GPs, nurses, and pharmacists) that were not identified in this combined approach. Pharmacists proved more difficult to recruit, potentially because they work in isolation and it is therefore more challenging for them to attend. Another limitation was the relatively small sample size and participants were from one geographical area in Scotland, albeit a large area. Healthcare systems differ in Scotland from other parts of the UK, which may have influenced the findings. However, the findings concur with the existing literature on health professional resilience, indicating that primary care is not overtly different from other areas of health care. There was a strong organisational component, which included systems that allow for ‘buffering’ when normal working practice is challenged; for example, during unexpected staff shortages. A sense of control over the working schedule was previously found to be a strong predictor of emotional resilience.8 Resilience at work can be promoted through efficient organisation structures, with forward planning and prioritisation, as well as using humour and having supportive colleagues. These were also identified in the literature.4,13 Indeed, in this study the overwhelming importance of teamwork was strongly emphasised. Similarly, when considering threats to resilience, previous research found that one of the largest threats to resilience was the volume of paperwork and information overload.10 In this study it was noted that this could detract from essential time for recovery and reflection, which is needed after dealing with difficult situations. Surprisingly, the question of more challenging patients was only raised in the rural groups and not in the groups covering deprived areas. The reasons behind difficult patients in the rural groups was that late presentation of conditions required more detailed investigations and referrals, which brought with them considerable paperwork. This has also been noted in previous research on rural workload pressures.12 Nothing was raised about the behaviour of challenging patients in any of the groups. 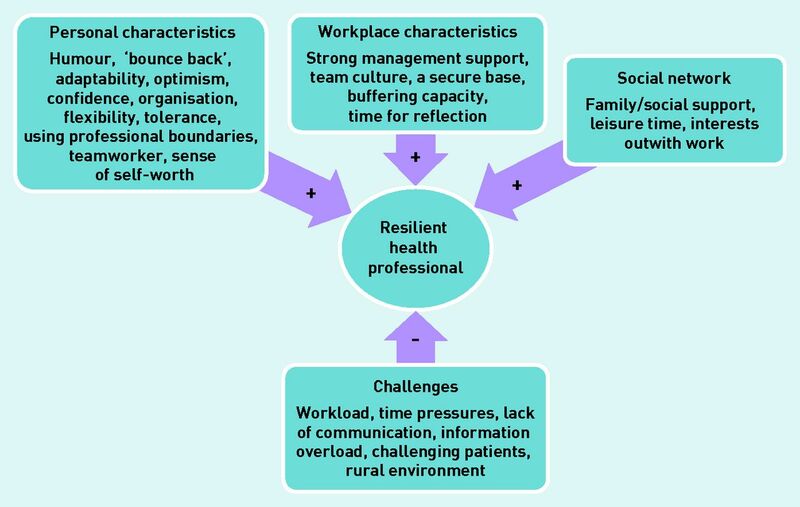 A model of health professionals’ resilience in primary care. The authors propose, based on this qualitative evidence, that for a health professional working in a community setting to be resilient (and probably also in non-community settings), their personal resilience must align with workplace resilience. It is this supportive workplace and/or a strong social network that enables the ‘bouncing back’ and adaptability that are so key to resilient health professionals. Challenges and enablers can work at a personal or workplace level. Importantly, a health professional’s resilience is considered to be more than just a personal trait and can be developed formally through training and informally through observing and learning from others. A further step would be to consider how current training (undergraduate and postgraduate) and support of health professionals draw on these concepts, whether explicitly or implicitly. The construction of a measure using this model as a framework would enable future quantification of professional resilience. Such a measure could be validated against existing measures of burnout. The research team thank all participants who attended the focus group sessions. Thanks also go to Dr Tim Jones and Dr Douglas Nicol for their help and support. The team also thank NHS Grampian Endowments for funding the study. Funded by NHS Grampian Endowment Fund (reference 12/42). Approved By University of Aberdeen College Ethical Review Board (reference CERB/2014/10/1135). Revision requested January 8, 2016. (2013) Protecting students and promoting resilience. BMJ 347:f5266. (2007) Personal resilience as a strategy for surviving and thriving in the face of workplace adversity: a literature review. J Adv Nurs 60(1):1–9. (2014) Relationships among perceived psychological growth, resilience and burnout in physicians. Pers Individ Dif 59:120–123. (2013) If every fifth physician is affected by burnout, what about the other four? Resilience strategies of experienced physicians. Acad Med 88(3):382–389. (2013) A survey of resilience, burnout, and tolerance of uncertainty in Australian general practice registrars. BMC Med Educ doi:10.1186/1472-6920-13-2. (2011) Resilience among doctors who work in challenging areas: a qualitative study. Br J Gen Pract doi:10.3399/bjgp11X583182. (2016) Resilience in primary healthcare professionals: a systematic review. BJGP doi:10.3399/bjgp16X685285. (2007) Predictors of physician career satisfaction, work–life balance, and burnout. Obstet Gynecol 109(4):949–955. (2011) The resilient practitioner: burnout prevention and self-care strategies for counselors, therapists, teachers, and health professionals (Routledge, New York, NY), 2nd edn. (2008) Stress, burnout, and strategies for reducing them: what’s the situation among Canadian family physicians? Can Fam Physician 54(2):234–235. (2012) General practitioners at the deep end: the experience and views of general practitioners working in the most severely deprived areas of Scotland. Occas Pap R Coll Gen Pract 89:i–viii, 1–40. (2002) Workload pressures in rural general practice: a qualitative investigation. Scand J Prim Health Care 20(3):139–144. (2014) Working on the edge: stresses and rewards of work in a front-line mental health service. Clin Psych Psychother doi:10.1002/cpp.1912. Scottish index of multiple deprivation 2012, http://simd.scotland.gov.uk/publication-2012/ (accessed 18 Apr 2016). Scottish Government urban/rural classification, http://www.gov.scot/Topics/Statistics/About/Methodology/UrbanRuralClassification (accessed 18 Apr 2016). (2008) Building physician resilience. Can Fam Physician 54(5):722–729. (2015) Resilience: what is it, why do we need it, and can it help us? Br J Gen Pract doi:10.3399/bjgp15X687133.